Opening Greeting: Miss Melanie usually greets her kiddos with a sort of chant: "Hello, ______!" (Think "Let's go, Blackhawks!"). I replicated this greeting for each child, and I got all of the names correct because of the aforementioned pre-program nameplates. "Head, Shoulders, Knees, & Toes"
Stories: I gauged the level of audience engagement to figure out the best time to share our stories. 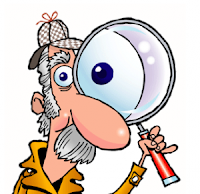 Both stories involve kids using their hands to create a spyglass (or telescope, or binoculars) so they can help spy items in the book's pages. I Spy What Animals Eat - Using green poster board, green cardstock, Velcro dots, and pieces from my library's assorted flannelboard collection, I put together bushes with foods hiding under the leaves; sometimes the foods were fruits, other times they were pizza or muffins. After demonstrating an elephant and a zebra hand puppet who like to find and eat fruit, I passed out puppets to let the kids help their animals spy what they wanted to eat. Kids would lift the leaf flaps to spy the foods in the bushes. Parachute Time - With our good-sized group, caregivers helped me move the parachute over the kids' heads as they explored underneath. After one round of "Colors Over You," one child got it in his mind to try to use the parachute as a slip-n-slide. Thus it was time to put the parachute away. I Spy Bottles - Using a model similar to Brooke's, I created I Spy bottles filled with beads for kids to turn and observe. I used bottles of craft sand for the container, and I mixed in beads that looked like animals as well as letter beads. I superglued those lids shut, and they've held up so far. Some of the kids were absolutely mesmerized by the activity of turning the bottles and looking at the different hidden items. Craft: For our group process art craft, we focused on fine motor skills by sticking different colors and shapes of stickers on our own spyglasses (paper towel tubes). Bubbles! It's a tradition in our twos programming to end with the bubble machine. The kids really look forward to seeing, playing in, and popping the bubbles, and the bubbles serve to gently signal that story time is ending. I had a meeting last week with some local homeschooling parents. The purpose of the meeting was to open up lines of communication between the library and these library customers--to start a discussion about what expectations we have for one another, and the sorts of services the library is equipped to provide. To support this conversation and give parents a reference for what the library offers to their children, my library district came up with a Menu of Library Services for Children & Teens. This one page, front-and-back document highlights the variety of programs and services available to all families and groups in the community. 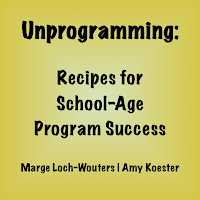 It mentions preschool, school-age, and teen programs that the library offers on an ongoing basis; reference and interlibrary loan services; meeting room reservations; and downloadable resources ranging from ebooks and eaudio to magazines and music. Library Tours -- We can customize a tour to fit the ages and needs of the group, throw in a story, and wrap everything up with a learning-reinforcing scavenger hunt. Book Group Events -- We can facilitate a discussion where every child has read the same book; we can facilitate a discussion wherein children talk about the different books they've read (peer reviews are great for inspiring reluctant readers! ); and we can host events bursting with librarian-led book talks to entice readers. Electronic Resources Workshops -- We can offer information- and resource-specific workshops that give children exposure to and practice with any of the library's diverse electronic databases. Speakers -- Three branches in my district boast librarian specialists in health resources, business and nonprofit resources, and genealogy and local history, and these specialists can give presentations on their subject areas. We also have librarians equipped to talk about storytelling, early literacy, and finding "just right reads." These a la carte menu items, if you will, were a delightful surprise for the homeschooling parents with whom I met. These are the sorts of library services they want--getting their kids acclimated to the library and how it works, exploring in-depth research options--but had previously been unaware of. I'm excited that my library district now has a formal, printed menu of services that librarians like me can use as a reference when having conversations with caregivers interested in finding out what's available for their kids. Even more than that, however, I'm excited that we've opened the lines of communication between the library and a core group of our heavy users, homeschooling families. The more we understand one another, the better our relationship will be. I had a great conversation with a library mom the other day. She came to tell me how much her son enjoys the school-age science programs at my branch, and she asked if I had heard of something called STEAM--STEM with an A. Oh, boy. Do I need to tell you how excited I was to have a conversation about STEAM, one of my favorite things in the whole wide world, with this enthusiastic customer? It was great! And even better, I was able to tell her about our upcoming STEAM programs--including Playground Adventures, which she brought her son to after our conversation. I love when these sorts of interactions happen. But let's talk about Playground Adventures. 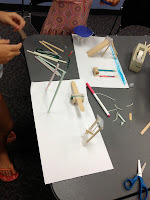 My thought process for the program was to combine some information about and examples of simple machines with a hands-on crafty/building/making activity. After I attended a STAR_Net webinar called Playful Building, I knew playgrounds were the perfect premise for this program. 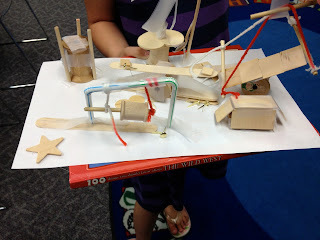 We started off talking about simple machines. I asked the kids in attendance (about a dozen) what they already knew about simple machines, then I talked about some of the common ones. I used everyday objects as examples: inclined track and train from the train table for inclined plane; doorstop for wedge; yo-yo for pulley; catapult for lever. As I talked about and demonstrated each machine, I asked the kids to think about where they might see these machines at work on the playground. They had great ideas. Then we spent the rest of the program time--45 minutes--building our own playgrounds. I set out legal-size paper as the building base, and I assembled a variety of other materials for building as well: different colors of paper, drinking straws, assorted wooden pieces, thimbles, yarn... We had tape and a hot glue gun for assembling playground parts (I wielded the hot glue gun), and markers and colored pencils were available for optional embellishment. These kids spent the entirety of the remaining 45 minutes deep in their building processes, coming up with great playground ideas and very smart engineering problem-solving decisions to build what they had envisioned. The resulting playgrounds were varied and great, and the children described them to me with definite pride. Despite how relatively simple and low-intensity the program was, all of the kids thanked me profusely for offering the program. That response serves to reinforce my belief that one of the key things we (libraries) can provide for children is a space in which they feel comfortable to explore their own ideas. One of my goals in offering children's programs in my branch library is to promote materials in our collection. My colleagues and I do a pretty good job of promoting books, audiobooks, music CDs, and DVDs in our programming, but we hadn't really tapped the videogames collection. 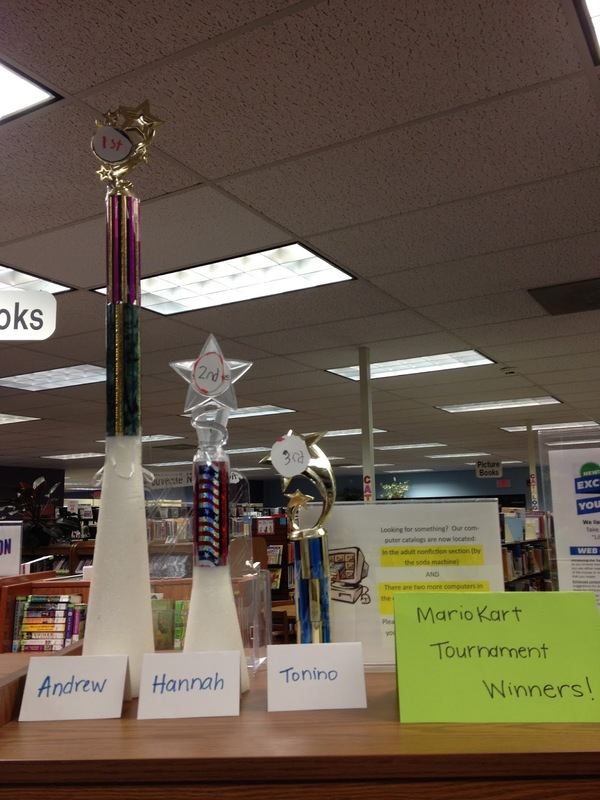 This summer, I rectified that deficiency by offering two Mario Kart Tournaments on one of our district's Wiis. I heard from a lot of kids after the program, and they all said they had a fun time having a friendly competition at the library. Lots of kids play Mario Kart at home or on their portable DS consoles, but they don't always get the chance to race other kids--which makes gaming at the library great. Many parents also expressed their thanks at offering the event, which took place over the course of 2.5 hours on a Saturday in June and again in July. It gets pretty darn hot in the summer here, and I love making the library a destination for a cool activity. Practice Rounds - As children entered the program room, I asked them to please fill out notecards with their names and ages. I kept the cards in the order in which children arrived, and that sequence made up the order for our initial practice races. Some teen volunteers helped me set up the Wii so that four children could race at a time; they also set the game so that a "round" equalled two games, and while racers could choose their characters and vehicles, the racetrack was selected randomly. Each child got to race two practice races during the first part of our program. The Tournament - Once every child had completed the practice rounds, the tournament began. I created a bracket using those name/age cards I had the kids fill out, and I made the bracket pairings by ages. Thus, in the first round of the tournament, 6-year-olds were racing other 6- and 7-year-olds, 12-year-olds were racing other 12- and 13-year-olds, etc. The tournament happened with the same settings as the practice rounds, which meant each bracket pairing raced on two tracks to determine the overall race winner. That winner would move on to the next bracket, which I again paired by ages. The way Mario Kart keeps score, racing twice means that two players may end up tied for first place; in these instances, both first place racers advanced to the next round of the tournament. We kept progressing through the tournament bracket in this fashion until we were down to the final four-person race. watching/cheering - I set up a close viewing area right in front of the wall where we projected the races, and folks could also sit at tables behind the racers; I did set the only rule, which was "only cheering, no jeering"
The Timing - The way the timing breaks down has a lot to do with how many people enter the tournament; set your program capacity so that your tournament lasts the amount of time you want it to. In our two tournaments, not everyone stayed for the whole program; some folks left after they had been eliminated from the tournament, or had grown a bit bored of watching the races. The Winners - I made a big fanfare out of the final round of races, using my best sports announcer voice to give something like a play-by-play. (Note: It's a good thing I'm a librarian and not a sports announcer.) When the winners were evident, I presented the trophies as well as the other pictures and certificates that some of the children had made. Many kids wanted their pictures taken with their trophies, and once that was done, I made name cards to accompany the trophies on their display on a prominent shelf in the library. The trophies are still up on that shelf, proclaiming the names of the tournament winners for all library visitors to see. Do you have questions about this program? Have you offered something similar at your library for school-age kids? Let me know in the comments! I've got posts on two other youth services blogs today; I hope you'll click over to read them if you're interested. 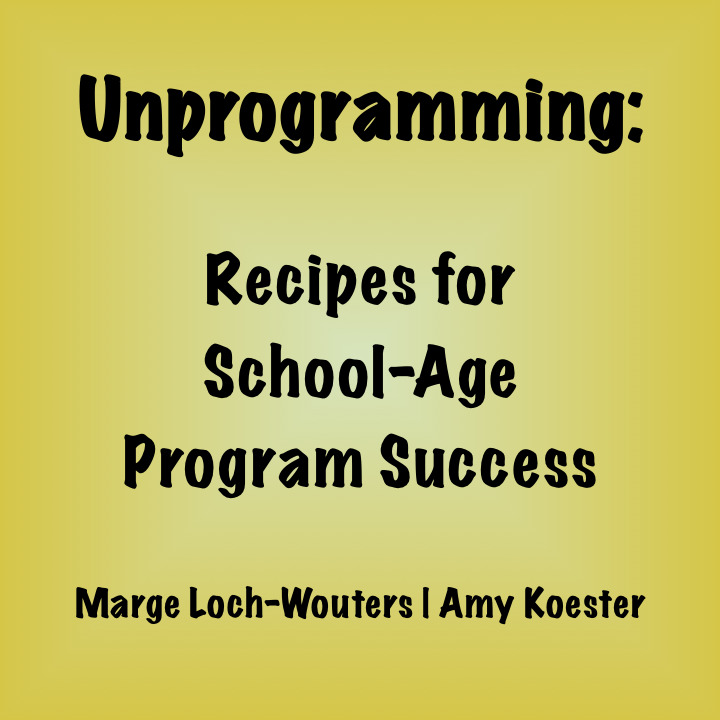 First, I'm on the ALSC Blog talking about my Egg Drop program, a school-age science program that was a huge hit with my kiddos last month. Steal the program! I'm also over on GreenBeanTeenQueen, where Sarah has been running a series called "So You Want to Read Middle Grade," featuring all sorts of guest bloggers. When she asked me if I wanted to participate, I got very excited at the prospect of bringing older readers back to the great MG they may have missed since they "aged out." I even mention Doctor Who. 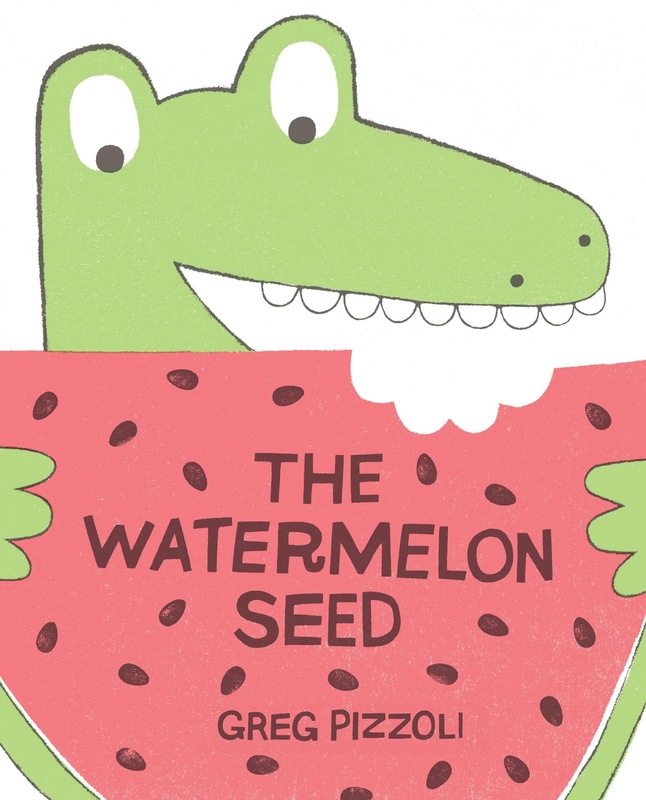 This bright, simply illustrated picture book hits on a topic that doesn't seem too far-fetched to most youngsters: a crocodile who loves watermelon accidentally swallows a seed, and he's worried he's got a watermelon growing in his belly. 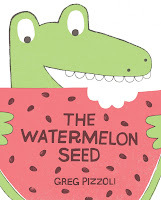 This book offers great opportunities for talking about what seeds need to grow, what happens when you swallow something, etc., as well as a perfect invitation for giggles when the crocodile gives a giant burp. 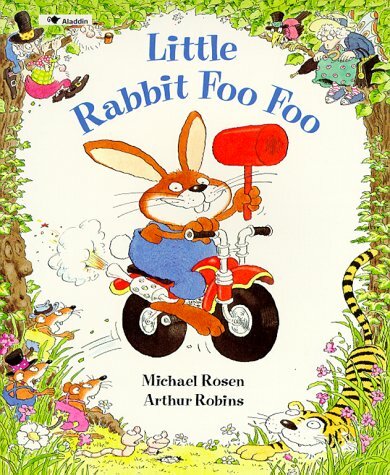 I learned this song at Guerrilla Storytime at #ala2013, and I've used it many times since. For this story morning group, I handed out egg shakers to accompany our shaking as per the song's instructions. We sang the song three times due to its popularity, with the final verse sung quickly enough to prompt us all to fall down dizzy at the end. This book app shares the story of Chester as his mother helps him overcome his nervousness about going to school. This story has long been a classic for a reason, and I decided to share it this time because preschools will be starting up again soon. I projected the app in its "Read it Myself" mode, which allowed me to go through the app at a pace that suited the children in attendance. I read the story with the help of my own Chester raccoon puppet, whose paw the kids enjoyed kissing after the story. How's that for transmedia storytelling? Songs: "I'm a Little Teapot" and "The Itsy Bitsy Spider"
We rolled the song cube to see what song we would sing next as a group. After twice singing "I'm a Little Teapot," the kids asked to roll the song cube again. I of course obliged, and we launched into an enthusiastic rendition of "The Itsy Bitsy Spider." 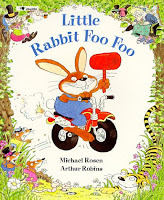 For the folk/fairytale portion of our story morning, I decided to share this great version of "Little Bunny Foo Foo," a song it appears many children no longer hear from their caregivers. 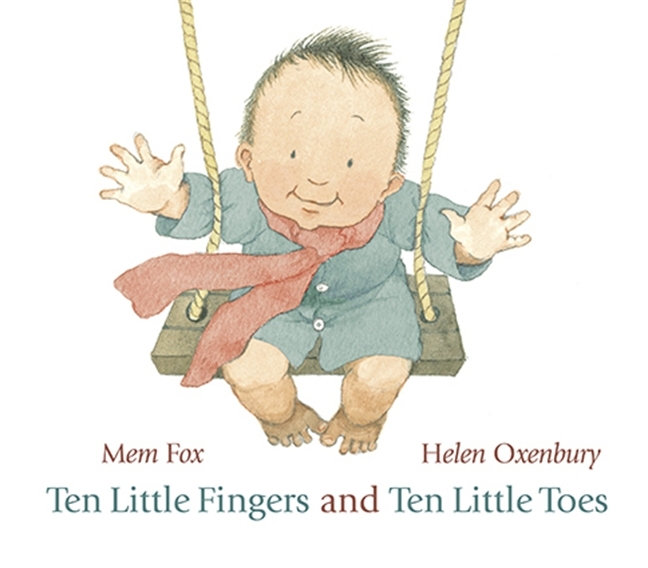 This small book boasts so many fantastic qualities and early literacy opportunities: it's got great vocabulary ("attitude," "goblins"); it reinforces counting; it's got a repetitive style that draws kids into participating and helps them remember the story; it can be sung; and it's got a bit of silliness mixed in with the moral. We enjoyed some cinnamon Teddy Grahams and milk immediately after finishing our storytime portion of the morning. Mmm! As with previous implementations of this program, I set out a variety of my library's educational and open-ended children's toys for the free exploration of the children in attendance. The science station was once again a hit, especially the magnets. Also extremely popular were the library's new alphabet machines, which I decided to purchase after reading a great testimonial about the toys in someone else's library (I can't remember on whose blog I read about it; that bookmark got lost in the transition-from-Google-Reader shuffle. [Update: the original post was on Anna's blog. Thanks to reader Amanda who pointed me to the post!]). I saw kids and caregivers identifying letters, naming images, creating patterns--really, these things are quite versatile. How have you been incorporating play for preschoolers at your library this summer? This summer, I've been offering a picnic lunch-and-reading program again--this year I opted to call it "Picnic Lunch @ the Library." (See last year's post for full how-to details.) This program tends to draw a smaller crowd; I usually get somewhere between 10 and 20 attendees, including caregivers. The small party of picnickers, however, makes for a relaxing, particularly child-directed program. The kids don't really like one of the stories? Well then, we move along to another. When I was planning the summer program calendar, I decided to name a theme for the books to be shared at each Picnic Lunch @ the Library. As a result, I got two totally different crowds of kids: children were excited for folk and fairy tales when they came to the Fairy Tales Edition, and the animal lovers chose to attend the Animal Tales Edition. Both groups said they enjoyed the quiet time to listen to a bunch of books read aloud. Oh, and they also like that listening to me read for an hour counts toward their summer reading goals. After each story, the children tried to decide what the moral of each tale was; after all, as one child pointed out, fairy tales always teach some sort of lesson. We ended with Flora and the Flamingo, at which point the children wanted to discuss what sorts of music they sometimes hear in their heads when they read different books. 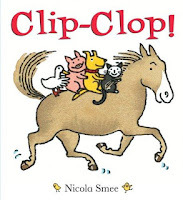 I confess I always hear Clair de Lune as I flip through Idle's wordless picture book. Do you offer any reading and/or read-aloud programs in conjunction with your summer reading program? Last month, I posted a survey form on this blog asking readers to share their favorite books to use in baby programs. I know I'm always looking for new titles to explore, and there are plenty of gems on this list. I blogged recently about the terrific Guerrilla Storytimes that took place several afternoons at ALA. In case you were worried these Guerrilla Storytimes--this advocacy for youth librarians--might be an isolated occurrence, fear not. 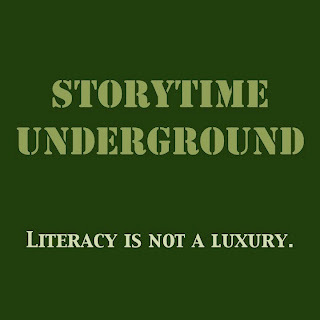 Because the Storytime Underground is live. That's right, there's a whole website--nay, a whole community--dedicated to storytime guerrillas like you and the awesome work you do. The site went live last night, and Cory's opening post sets the tone perfectly. Go read it. The whole point of the Storytime Underground is for youth librarians and their ilk to support each other, promote each other, and train each other. And to that end, I hope you'll get involved. That means making Guerrilla Storytimes happen at library events near you, and adding them to the Storytime Underground calendar. It means posing your storytime questions for the Ask a Storytime Ninja feature, and it means volunteering to be a storytime ninja because you have real expertise to share. Getting involved means sharing the great ideas you find online, be they your own or someone else's, so that the whole Storytime Underground community can benefit. It means sharing what you've learned through your library experience, and learning from the experience of your comrades. That's what the Storytime Underground can be. So bookmark the site. Add it to your RSS feed. 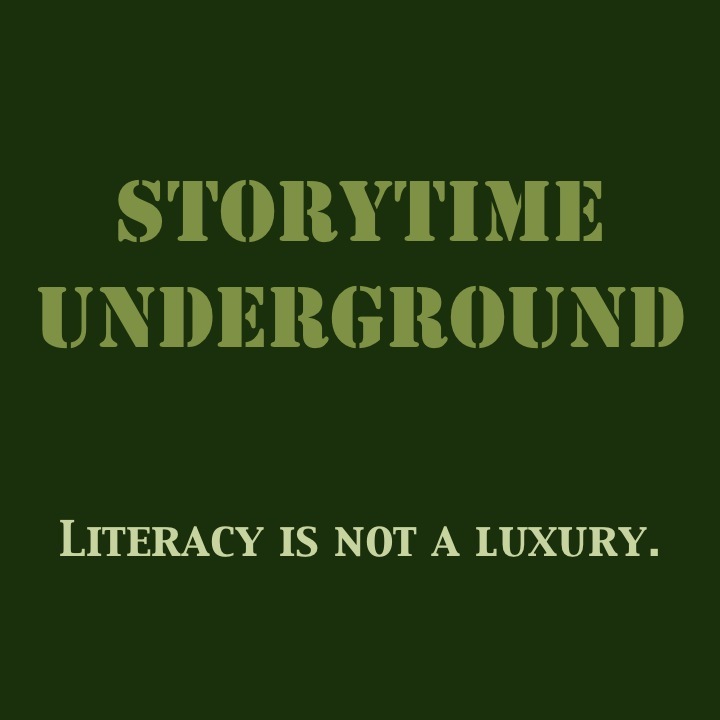 Join the Storytime Underground group on Facebook. Join us in this revolution. I would be remiss to not thank the talented collaborators who made the Storytime Underground site what it is, especially in such short time. So thanks, Cory, for brilliant ideas and inspiring speeches; thanks, Kendra, for setting the framework and sharing great content ideas; and thanks, Anna, for hooking the site up with an awesome header graphic. I salute you all. When Sue McCleaf Nespeca asked me to lead a conversation on STEM in storytime for the Preschool Services Discussion Group at ALA Annual in Chicago, I knew I wanted to accomplish two things: 1) I wanted to share the diversity of options libraries have when it comes to incorporating STEM into preschool services, from small modifications of existing programs to creation of new programs; and 2) I wanted to leave ample opportunity for open discussion and idea-sharing. Looking for a play-based program model with great STEM potential? Look to the MAP program--for Messy Active Play--at the Suffolk County Libraries on Long Island. Want to partner with organizations or get grand funding for STEM activities? Suggestions shared include making contact with your state's agricultural school extension and seeking grant funding for gardening through Katie's Krops. Many discussion group attendees also raved about the previous day's program, "What's Hot in STEAM Education: How Using ECRR2 Supports Literacy, Common Core and School Success." I was bummed to have to miss the program due to a meeting conflict, but I was happy to hear all program materials will be shared on the ECRR Ning. Hooray for sharing resources! I'll finish off this recap post with my slides, which go with the handout I had for the discussion group meeting. If you have any questions at all, about this particular discussion or STEM/STEAM in general, don't hesitate to ask. Thanks to everyone who shared their ideas and expertise with the group in Chicago. 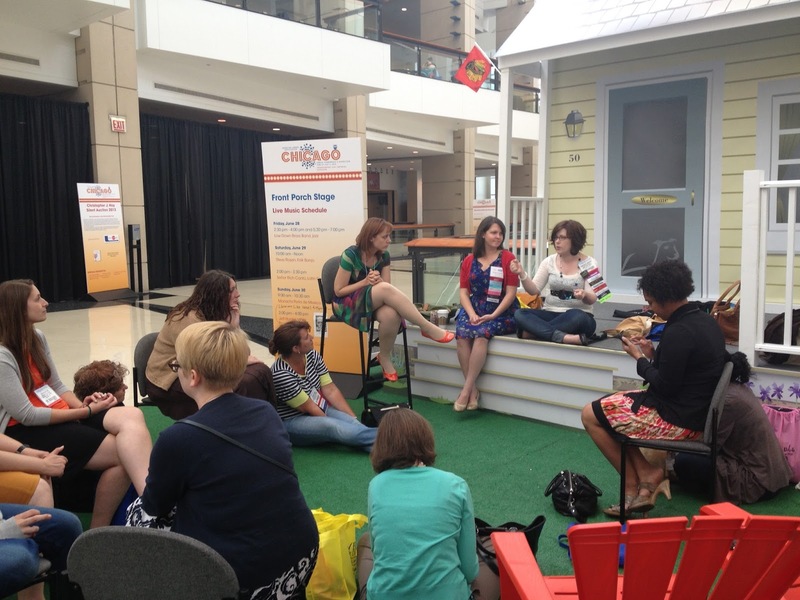 In the lead-up to the 2013 ALA Annual Conference, you may have heard rumblings about Guerrilla Storytime. The pre-Chicago online chatter about the informal movement resulted in a great crowd of attendees in the Uncommons for the advertised Friday and Saturday storytimes. That stellar attendance (upwards of 75 folks dropped by and/or participated each of those days!) led Guerrilla Storytime idea-genius Cory Eckert to stage a completely impromptu edition on the Monday afternoon of the conference, too. But wait. I'm getting ahead of myself. Let's start at the beginning. Cory Eckert, the idea-genius I just mentioned, is the youth services manager at the Octavia Fellin Public Library in Gallup, New Mexico. Back in March, Eckert took to Twitter with an idea for storytime skills building and advocacy among the larger librarian population. 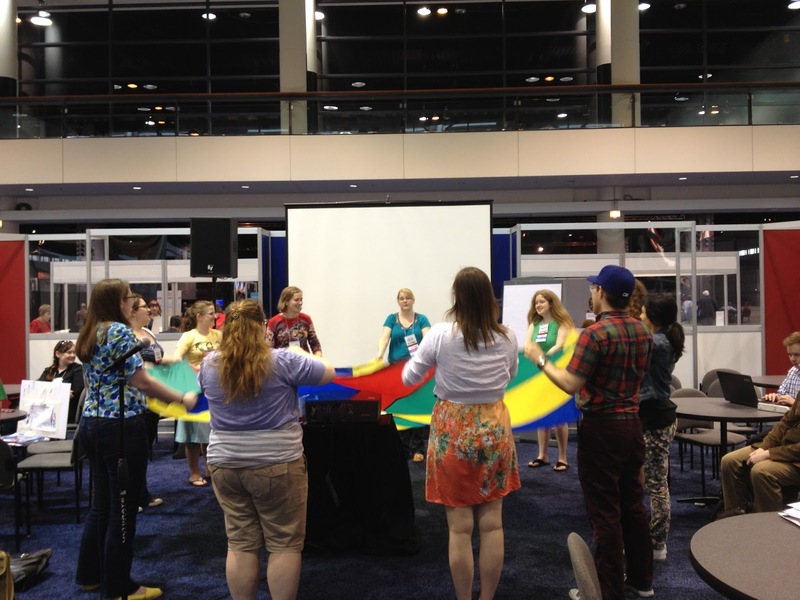 Why not stage pop-up storytimes at a major library conference like ALA Annual? 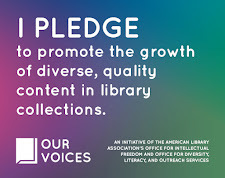 Such an event would allow youth services librarians to share their expertise and learn from their peers, and the fact that other non-YS librarians would be able to see the activity in the public space would foster awareness that storytime is so much more than just reading books to kids. Anna Haase Krueger of Future Librarian Superhero created a Google Group to allow interested librarians to continue the conversation in depth, and shortly after the term "Guerrilla Storytime" was chosen as the name for the project. Cut to last Friday in Chicago. At 3 p.m., a group of children's librarians entered the Uncommons as planned. Then more and more people started to join as Guerrilla Storytime got underway. The beginning premise was straightforward: participant volunteers would select a storytime challenge from the Challenge Cup, then respond to that challenge using their own knowledge or by asking the audience for assistance. Challenges were brainstormed by Eckert, Melissa Depper of the blog Mel's Desk (and 2013 Mover & Shaker! ), and myself, and they included such topics as incorporating early literacy skills and practices into storytime, favorite and go-to rhymes and songs, and strategies for responding to storytime problems (moms talking in the back, we're talking about you). 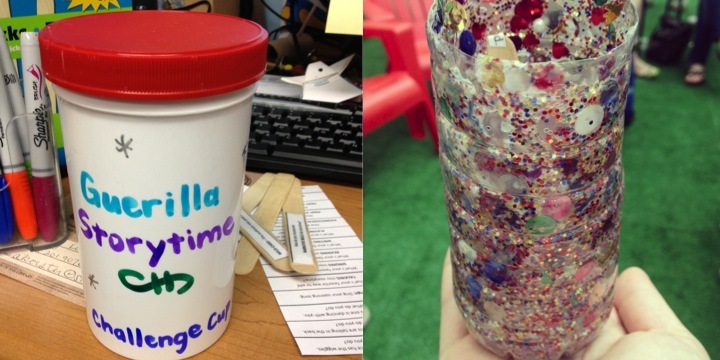 Guerrilla Storytime Challenge Cups can all look different. On Friday, Guerrilla Storytime started with a few brave souls getting the energy pumping. After the initial few challenge-seekers, more and more attendees opted to try their hands at storytime skills and share ideas with their colleagues. What do you do when the moms in the back won't stop talking? Cate's strategy is to stop talking, or whatever activity she is doing at the front of the room. If the obvious pause in storytime doesn't stop the chatter, then Cate will start to make silly faces. Of course the kids notice, and of course they start to make silly faces back. Suddenly, in the unexpected quiet and barrage of goofy faces, offending talkers usually get the picture. Trying out some favorite parachute songs. Favorite parachute song? 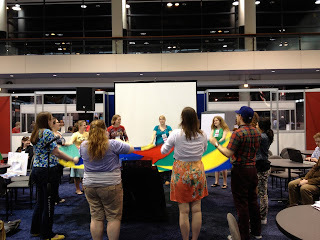 Kendra grabbed the parachute that Katie generously brought to the convention center, and a small army of storytime guerrillas jumped up to play along. Kendra's favorite song to share during parachute play time--especially with toddlers and younger preschoolers--is "These Are the Colors Over You," a simple song about the colors on the parachute set to the tune of "Twinkle Twinkle." As you can imagine, a singalong ensued. How do you incorporate letter knowledge into storytime? Instead of creating an entire storytime around a single letter, a storytime guerrilla says that she'll tell her kiddos their "letter of the day;" whenever the group might encounter that letter during storytime, everyone makes note of it together. We all know how much kids love seek-and-find activities, and this strategy emphasizes letter recognition without derailing your storytime theme. Your kids have the wiggles! What do you do? Rick got the whole group standing to participate in his go-to wiggles-be-gone trick: the chant "Form the Orange." This one is solid gold. What do you do when your storytime crowd has grown too large, but your supervisor doesn't see that as a problem? A few voices chimed in here with some great ideas. One, have a discussion with said supervisor about the goals of storytime; this discussion can allow you to voice concerns about meeting specific goals in a too-crowded room. Second, invite said supervisor to storytime. Sometimes, it takes the visual of seeing kids unable to adequately participate due to group size to impress the notion that program size matters. Favorite cumulative stories? There Was a Tree, The Great Big Turnip, This is the Jacket I Wear in the Snow, and I Ain't Gonna Paint No More (for which Cate dons a painter's full-body smock and lets kids paint her!). Favorite shaker song? Mel got in front of the group to lead a rousing rendition of "We're Going to Kentucky." How do you incorporate vocabulary into storytime? Katie shared her modification of "The Itsy Bitsy Spider," which she uses to talk about size words and family words. Katie starts with the familiar Itsy Bitsy spider, who is then accompanied by his younger sister, Eensy Weensy, and his older brother, Big Giant spider. Mel has shared her takeaways from the Saturday Guerrilla Storytime on her blog. Favorite fingerplay? 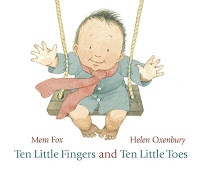 Marge shared a rendition of "Five Little Monkeys Sitting in a Tree" that uses sign language as the finger playing; when she shares the fingerplay in storytime, she always does the last verse ("One little monkey...") silently, everyone using just their hands. Then Julie shared her delightful "Five Little Hotdogs"--a bit of fun absurdity to add to storytime. Best books for incorporating narrative skills? Monkey & Me; Oh, No! ; and Animal Masquerade were highly-recommended titles. Best practices for incorporating books with foreign words? Make laminated pictures of the unfamiliar words, then use the pictures as references whenever the word appears in the story. Before you know it, "gato" will so obviously mean "cat" to your storytime audience. Was Guerrilla Storytime successful? As a storytime provider who left with lots of new ideas, I would say so undoubtedly. What about from an advocacy perspective? After Friday's Guerrilla Storytime, an adult services public librarian came up to me in the Uncommons and said how much he enjoyed seeing all of the different things that can happen in the storytime room. After the Monday edition, Steve Thomas interviewed Eckert about the Guerrilla Storytime project for his library podcast, Circulating Ideas. Guerrilla Storytime appears to have begun to reach even a small group of non-YS librarians with information about what storytime really entails (and how knowledgeable, how expert, storytime librarians are). The best news: Guerrilla Storytime has every appearance of becoming a regular conference activity, albeit one that remains a bit off the grid. If you weren't able to take in Guerrilla Storytime in Chicago this past week, just look for Guerrilla Storytimes happening at future conferences like Midwinter, ALA Annual in Las Vegas, and perhaps even PLA and the ALSC Institute. In the meantime, share your favorite storytime skills and conference storytime takeaways on Twitter using #guerrillastorytime. There is so much we can learn from one another while advocating for the extremely important work that librarians do in storytime.